Beginning in 1983, ANAI facilitated a process in partnership with the local communities and the Costa Rican Ministry of the Environment that resulted in the creation of the 10,000 hectare Gandoca Manzanillo Jairo Mora Sandoval National Wildlife Refuge. Its continued existence is one of ANAI’s most tangible contributions to biodiversity conservation. Now fully integrated into the national protected area system as one its most precious jewels, the Wildlife Refuge conserves an unusually diverse assemblage of lowland tropical ecosystems, including lowland forests, the only mangrove forest on Costa Rica’s Caribbean coast, Raphia palm swamps, estuaries, the largest remaining cativo cathedral forest, the unique orey swamp forest, coralline headlands, coral reefs, sea grass beds, the lower reaches of a major river (Rio Sixaola) and critical sea turtle nesting beaches. ANAI also facilitated the process in which the refuge’s 7 distinct wetlands were recognized by RAMSAR to be wetlands of international importance. Through the initiative’s participation in drafting the decree creating the refuge, this became the first protected area in Costa Rica to be established with structures and guidelines for co-management by civil society and the national government. After 15 years of pioneering the practice of co-management, this experience and its promise were terminated when the nation’s Supreme Court found co-management to be unconstitutional. The ANAI team collaborated with the establishment of the San San Pondsak Wetland of International Importance, a 20,000 hectare protected area in the border region of Panama directly across the Sixaola River from Gandoca/Manzanillo, creating a connected bi-national community conservation area. Together the two new protected areas conserve ___ kilometers of sea turtle nesting beaches, lagoons, swamp forests and other unique habitats including what may be the only coastal peat bog in the western hemisphere. The Talamanca Land Trust was created, and now protects more than 1,000 hectares of unique rainforests and wetlands. The Marine Turtle Research and Conservation Program contributed to the protection of the leatherback, hawksbill and green sea turtles in the bi-national Caribbean lowland area from 1988 to 2007, including in both wildlife refuges, Cahuita National Park and nesting beaches outside of protected areas. During 15 years of conservation action and data collection, the success rate of leatherback nests on Gandoca Beach went from 0 – 90%. 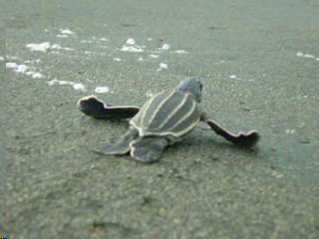 High quality scientific research on turtle nesting in the South Caribbean Region of Costa Rica was published annually. Being one of the earliest scientifically and community grounded sea turtle initiatives, best practices and national protocols were developed and widely shared. Thousands of national and international young people, scientists, students, protected area managers and community members were trained in the practice of sea turtle conservation through their participation as volunteers, interns and staff. Local people and the refuge staff continue to manage the turtle beach for community ecotourism, but scientific information is not being generated. An NGO formed by program staff, now called LAST, continues to be a sea turtle conservation leader in Costa Rica and Latin America. ANAI worked with the Kekoldi Indigenous Community to develop a sustainable management program for endangered green iguanas and a monitoring program for the world’s third largest migration of raptors. Together with their community tourism lodge and trained guides, they are the foundational elements of their broader cultural tourism initiative, which in turn provides the economic pillar for their efforts to conserve and sustainably manage their territory.